The people, products and history of Cutco and Ka-Bar are part of the fascinating story of innovation and commitment. 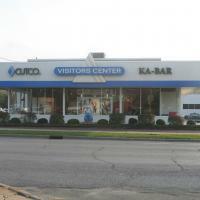 Thats tory unfolds in detail as you tour the Cutco/Ka-Bar Visitors Center. You'll find out about the dedicated people who created the unique products, learn about their ingenious solutions and discover how this company and its products have improved people's lives for more than 50 years. Follow the development of Alcas, the parent company of Cutco and Ka-Bar from its creation in 1948 as a joint venture between aluminum giant Alcoa and W.R. Case & Sons Cutlery Company. Olean was chosen for the first Alcas plant because of its proximity to the Case operation in Bradford, PA, as well as the many skilled cutlers who lived in the area - and it has remained a valuable member of this community ever since. Discover how the unique Wedge-Lock handle was developed by industrial designer Thomas Lamb, a pioneer in ergonomic design whose life work was studying how human hands manipulate objects. He spent more than six years of research developing his acclaimed Lamb Wedge-Lock handle - and in 1952 it became a hallmark of Cutco products.for their knives.